By Gottscho-Schleisner, Inc. – This image is available from the United States Library of Congress‘s Prints and Photographs division under the digital ID gsc.5a12096. It all started in May 17, 1792 when 24 brokers and merchants met under a buttonwood tree. Today, the One World Trade Center towers over the city, but in 1792, this tree was actually the tallest thing in Lower Manhattan, which, in retrospect is a pretty appropriate setting to sign an agreement that would grow to play a significant role in both the U.S. and global economies. It was under this tree that these 24 individuals signed the Buttonwood Agreement which established the grounds for trading at the then New York Stock & Exchange Board. 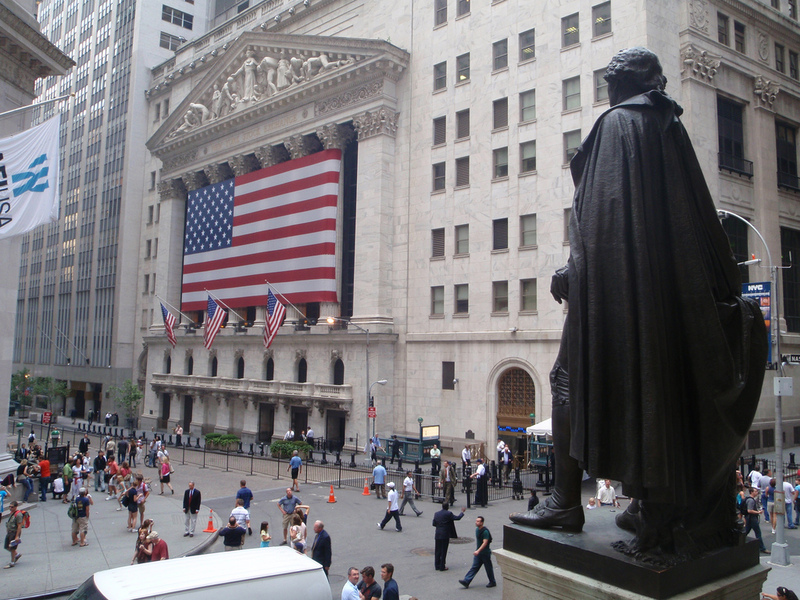 Its name was shortened to what we know today as the New York Stock Exchange in 1863. The NYSE has always been an exciting place with exciting things happening every second. You would see people frantically running around and shouting numbers and exchanging hand signals with each other. The Exchange even has a trading floor clock that does not have the hour markers, but just the 5-minute markers. This was because each trader had just 5 minutes to trade their stock! You could just imagine how hectic it got in there. However, up until the past few decades, all the trading was done on the trading floor. Today, with the rapid advances in technology, many trades around the globe have transitioned to electronic systems. The NYSE is becoming one of the few remaining trading floors with humans; however, that does not mean it is deserted and has been abandoned. In fact, the Exchange has adopted and retained a hybrid model that combines electronic and floor-based trading which makes it them that much more special. Although the NYSE is not as lively as it once was with the decrease in the number of frantic people running around and in the volume of open outcries, it is still just as exciting. Today, there are approximately 500 to 1,000 people trading on the floor. Possibly the biggest change in the demographics of the Exchange is that there has been more representatives from different media outlets across the world that come visit the Exchange. About 33 media outlets come in and out of the building to broadcast from the NYSE floor daily. Unfortunately, though, the Exchange is still not accessible to the public. Despite this, there are still so many ways to experience the NYSE without going inside so there is no need to feel left out! Every weekday the opening bell of the NYSE is rung at 9:30 a.m. EST to mark the start of the day’s trading and the closing bell is rung at 4:00 p.m. EST to mark the end of the day’s trading. When the guest ringing the bell fails to ring it for the acceptable amount of time– 10 seconds for the opening bell and 15 seconds for the closing bell– it is not uncommon for the floor to erupt into boos (Yes, they take their bell ringing very seriously). If you are lucky enough and happen to show up on the right day and time, you may even hear it emanating from the inside! In the past, the bells used to be rung by floor managers, but they started inviting executives, public figures, and celebrities to ring them, which became a daily event. If you come early enough, or late enough, who knows who you may spot by the NYSE and its surrounding areas. Nevertheless, the opening and/or closing bells is one of those things both New Yorkers and non-New Yorkers alike have to experience at least once in their lifetime! Just don’t show up on a weekend or a U.S. holiday. That would be quite unfortunate. For the past two decades, the Exchange started hanging “full façade” banners to celebrate and market special events and their listed companies. 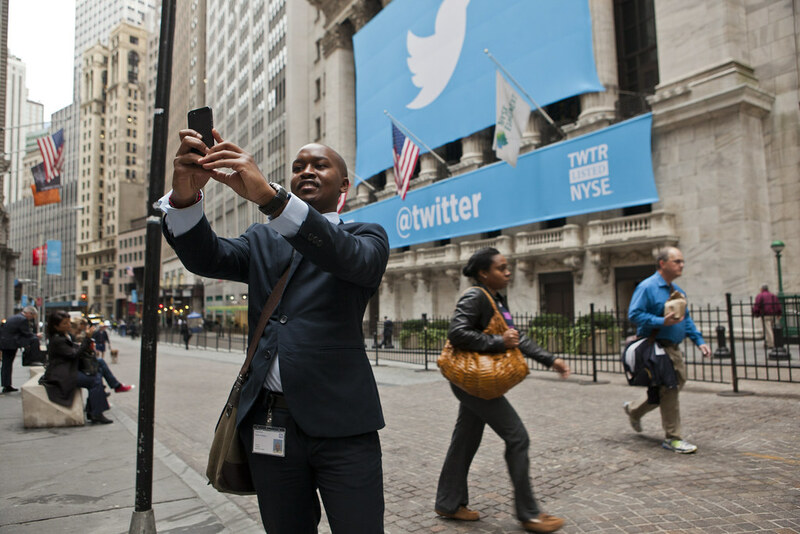 In the past, huge logos of Ford, IBM, SAP, Twitter and Instagram, to name a few, could be seen plastered across the NYSE; and, on special holidays, like Independence Day, the American flag would hang valently on the building. There’s no way you could miss it. The NYSE loves to build their brand with brands they work with. Maybe you’ll spot a company you love, know, or work at hanging grandly in front of the NYSE and it will definitely be a moment you can’t help but feel boastful about. Don’t feel shy to snap a picture (or a few– no shame) with it. You get the iconic NYSE and the logo of one of your favorite brands. That’s a double whammy! The NYSE hangs banners for their listings and for special occasions, but there are also certain days throughout the year that special events are held. One of these occurs during Christmas. Every year, there is a Christmas tree lighting in front of the Exchange. Lights are coiled around the Exchange’s Corinthian columns and around a massive tree. The moment when a single switch is flipped to light up the entire Exchange is truly an amazing and breathtaking sight. Listed company sponsors, artists, and partners come and are featured to celebrate the holiday season. 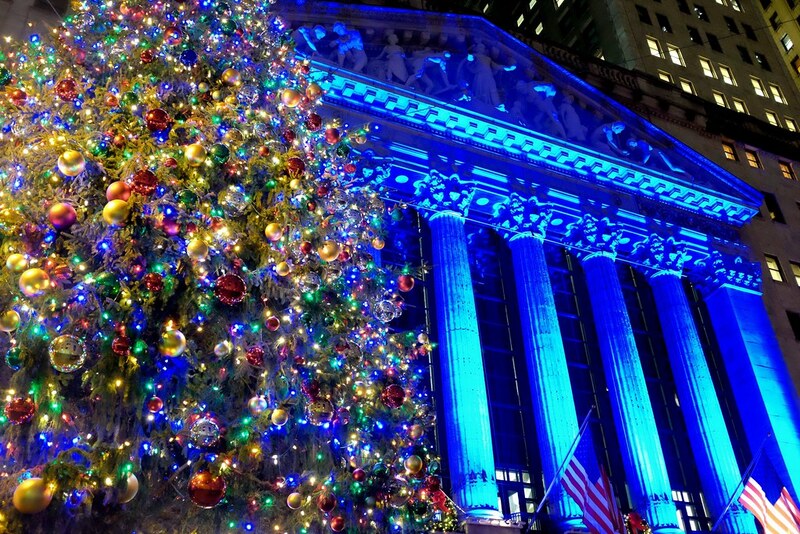 It is one of the oldest Christmas tree traditions that not only brings the NYSE to the public but the public to the NYSE. The NYSE may be quieter than it once was, but the culture is as present as ever and the buzz is as resounding as ever. Make sure to visit it or take a tour of Wall Street someday. The Wall Street Experience does an amazing job at giving an insider’s perspective of the financial hub. It is a great way to not only see the NYSE but also hear everything about it and more! Regardless, the NYSE is a must visit place.